Argentina coach, Alejandro Sabella, has named Barcelona star, Lionel Messi in his squad for a friendly international against Nigeria next month. Gonzalo Higuain and new Manchester City star, Sergio Aguero are also in the team. There is no place in the squad for Cityâ€™s unsettled star Carlos Tevez. The game is being played in Bangladesh on 6 September, a few days after Nigeriaâ€™s latest Africa Cup of Nations qualifier in Madagascar. The previous match between the two sides, in Abuja in June, is the subject of a FIFA investigation into suspicious betting patterns. The world governing body has been unable to track down the referee for the match, Nigerien official Ibrahim Chaibou. The Argentina squad for that game was a considerably weakened one but the line-up for the game in Bangladesh is much stronger. Sabella has also named a parallel squad of home-based players for two games against Brazil in September. The team for the Nigeria match, and for one against Venezuela in India, is largely made up of European-based players. 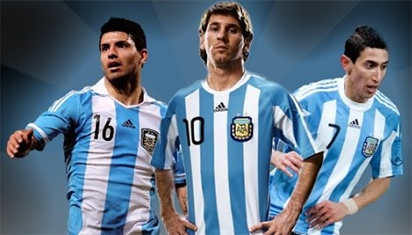 The post Argentina names Messi, Aguero, Di Maria for Nigeria friendly appeared first on Vanguard News.